Ex-skiers, ex-climbers, ex-hikers take on long-distance travel with motorbikes. In the nascent stages of any adventure, an innocent beer can open the gateway to wanderlust, which can quickly lead to a road map spread out on a table. We charted Barnstormer’s objectives on the map, following ever-thinner lines until they washed out into the blank spots of southern Utah. Some of our goals were clearly marked on the newly designated Backcountry Discovery Routes, a network of backcountry trails on public lands mapped by the BDR, a nonprofit organization, with the help of volunteers in the Western U.S., and as of this summer, along the Eastern seaboard as well. Others were obscure spurs off — oftentimes very far off — those designated routes. Questions emerged as the beer warmed and the night stretched on: Was there really a road or trail there or not? Would we have enough fuel to make it there, and, more importantly, back? Brett Lannan navigates a series of washed-out sandstone ledges in southeast Utah. Brett Lannan (foreground) and Stephen Barnes scope out the last stretch of the Burr Trail leading toward Boulder, Utah, after 4 days riding. Stephen Barnes navigates the switchbacks through a gap in Waterpocket Fold along the Burr Trail while on an 800-mile trip through southeast Utah. Exploring Waterpocket Fold along the Burr Trail en route to Boulder, Utah, from Lake Powell. 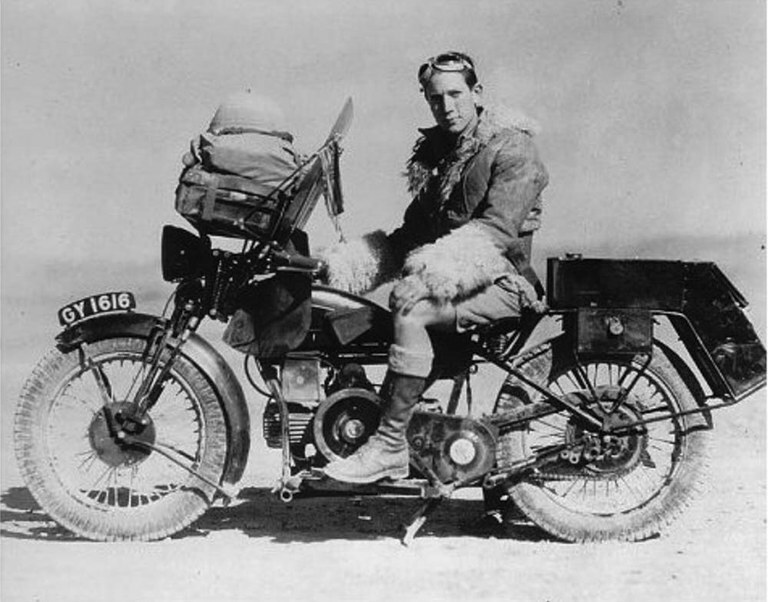 Robert Edison Fulton Jr. in 1937, when he rode his motorcycle around the world. Like me, my companions in this adventure were lovers of wilderness, and many of the remote places we intended to explore were essentially roadless. Our plan was to ride until we couldn’t, and then hike, scramble and climb to our destination, traveling on foot as light and fast as we could on our stripped-down motorbikes. Save for the obvious carbon footprint and the knobby tracks in the soft sand, our multi-day, two-wheel adventure ride would adhere to the Leave-No-Trace ethos championed by backcountry bipeds. We would be heard, seen, and then gone. Most of the adventure-loving motorcyclists I’ve met emerged from previous or parallel lives also spent in the backcountry, whether as climbers, skiers, trail runners or hikers. We have simply supplemented our backcountry lust — and age-induced loss of testosterone — with a bump of octane. And a new vocabulary. Our slang is as unique as the colorful place names spread across the canyon country of the Colorado Plateau. But tease apart our subset of off-road, adventure-driven, motor-head lingo — slab, gravel-grinding, thumpers, oilheads, airheads, hexheads, etc. — and you can see a common denominator that traces back to the days when people like Robert Edison Fulton Jr. hemp-strapped a few rucksacks and a movie camera to his two-cylinder Douglas motorcycle and set off to ride solo around the world in 1932. (See his book, One Man Caravan, published in 1937.) His objective was no different than ours today: to penetrate distant lands by self-sufficient, independent means, for the sake of adventure. There is a technical side to the rush. For the uninitiated, the differences between the motorcycles we use and the other off-highway vehicles buzzing around the public lands are difficult to grasp. Adventure bikes come in many shapes and sizes, each with its strengths and weaknesses. An Enduro dirt bike is not a dual-sport, but it could be with the right modifications. Some dual-sport bikes can go anywhere a dirt bike can go, or farther. Others cannot even make it up a gravel driveway. It all depends on suspension, fuel capacity, tires, gearing, the weight of the machines and, most importantly, the rider’s skills and judgment. But the real joy comes from anticipating and then experiencing the places these machines take us. Advances in technology have produced lighter, stronger and faster motorcycles, backcountry snow machines, river jet boats and all manner of three-wheel, four-wheel and six-wheel ATVs, and now there are few places outside the national parks and wilderness areas that aren’t accessible to motorized visitors. Do I have mixed feelings about this? Of course. But, as with any craft, it’s all in how you use your tools. Our group — composed of Barnstormer, a mountain guide-turned-outdoor-industry advocate on a 640 Adventure (which, unfortunately, fell off the back of his truck at 60 mph that morning); a SpaceX engineer/Latin American poet on a BMW 800GS; a Brooklyn-based bombardier on the smallest thumper; an ultra-runner/adventure racer-turned Ayahuasca vision-quest guide; and me, thumping along on my 650 bullet-proof “Pig” — converged for the first time at the top of Utah’s Moki Dugway, a sinuous set of desert switchbacks on the southern toe of Cedar Mesa. We bivouacked under the full moon on the still sun-warmed rocks of Muley Point above the Goosenecks of the San Juan River. By the light of our headlamps, Jetboil camp stoves and a small sage-infused piñon fire made on a vintage hubcap firepan to avoid scarring the sandstone, we spread out the BDR and quadrangle topo maps to powwow about the morning’s route across Cedar Mesa to the ferry crossing on Lake Powell. Our wet and dusty gloves, Kevlar-reinforced pants and jackets hung from the handlebars of our machines, drying in a gentle desert breeze. We swapped stories and moto-jargon, true and false, under a star-studded sky. This was a backcountry brotherhood forged in the same spirit of the many wilderness treks that littered our collective pasts. The next morning we cleaned up our camp, straddled our motors and headed out again, eager to encounter the mysteries at the end of the next road. Photojournalist and filmmaker JT Thomas lives on the north edge of the Colorado Plateau, where he yo-yos between the high country and canyon country at every chance. JT is currently working on a film inspired by John Wesley Powell and the map he created demarcating the watersheds of the Intermountain West in the 1890s.